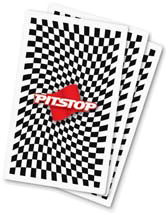 Ask for Pitstop at toy stores and wherever games are sold. Or, click below to go to the White Holland secure shopping page. If you have a gift certificate or discount code, be sure to read the instructions on the next page to receive your discount. DISTRIBUTORS: Please contact White Holland by email at sales@whiteholland.com or call 770-792-9955.